I was at an obscure and fairly deserted bar in Baguio City a few nights ago, having a heated conversation with an old friend from college. 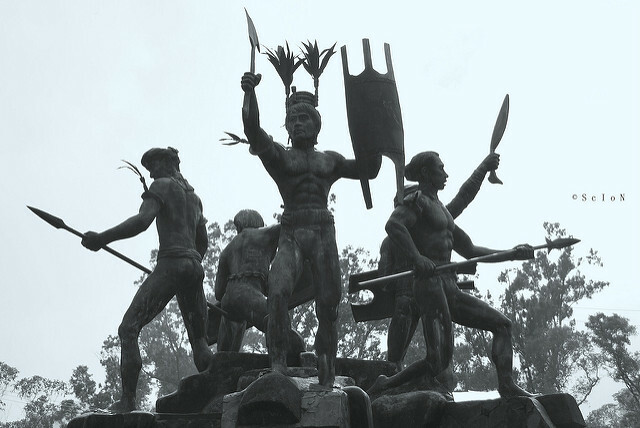 We were in the thick of discussing the main arguments I've put forth in the book about Igorot history and culture that I'm currently attempting to write. We've met that night with the sole intention of trying to iron out some of our differences when it comes to our views on Cordilleran culture. I'm her most ardent critic. She extends to me the same courtesy. Our exchange of cultural ideas has always been fervent ever since we met at a philosophy class in Saint Louis University over a decade ago. She has always been and will always be a good friend. But when it comes to certain ideologies and thought movements, we are the worst of enemies. I lost count how many times we've called each other "tabbed". That's the Kankanaey/Ilocano term for "idiot" or "moron". This is one of the things that I truly admire about her aside from being too smart (sometimes too smart for her own good). She's not afraid to call me an idiot if she catches me saying something idiotic. She is always quick to cut me off when I attempt to misdirect the conversation with another white lie. One time, I joined her and her husband, and their immensely cute little daughter for lunch. I was with the impression that she won't be that harsh with her critique of me in the company of others. I was dreadfully wrong. She called me "tabbed" numerous times in front of her husband and child while we conversed over steamed pork and carrot cake. That’s how uncensored and unguarded she is when it comes to topics she is very passionate about. I’ve always taken her outbursts as compliments because if I said something that jolted her brain, that means I’m making her think. I’m making a mark. This unique habit of hers amuses me sometimes. Her husband tried to apologize. I chuckled and brushed it off. I told him I’m more than used to it. We all had a good laugh before we called it a day. In a nutshell, she and I disagree more than we find common ground with regards to culturally-charged ideas and concepts. Most times, we find ourselves on opposite sides of the street. The conversations we have often have the same ending – we simply agree to disagree. Culturally speaking, she’s a purist. I, on the other hand, take a more flexible stance. For example, she loses her wits when she notices someone wearing the traditional Igorot attire wrong. She rattles her head as she starts another diatribe about women wearing the “bakget” or “ingay” wrong. Her attention to detail is beyond phenomenal. She knows the specific designs of traditional textiles woven within the confines of Kalinga, Mt. Province, Ifugao, and Benguet. She often sends me links to YouTube videos of people claiming to be dancing an Igorot dance when in fact the steps and the music are an "unbelievable mess" (her words, not mine). She thinks that the old Igorot folks at the Botanical Garden are giving the tribe a bad name. In essence, she wants our culture and our traditions to be where they were before western civilization came marching in and injected all sorts of influences and modifications. I understand her purist stance. In fact, I have the feeling that majority of Igorots today share her sentiments especially on the issue of preserving our culture and traditions to the exact letter. The consensus, I believe, is that nothing should get out nor get in. Keep the dances as is. Keep the indigenous attires as is. Keep the songs as is. To a certain degree, I agree with these purist tactics. However, I also believe that culture should evolve. It should be subject to change. Let us not forget how our ancestors danced, how they sang, how they dressed, and how they performed rituals. In fact, let’s record and put all of these original things into paper, into digital files, into moving pictures so that we can remember and celebrate them. Let’s practice and observe them for as long as we are able to. But at the same time, let us not allow this purist attitude turn into an impregnable wall that prevents our culture from evolving into something else. In pursuit of fairness, I have to admit that I used to have these purist tendencies with regards to Cordilleran culture. However, after soaking up the limited but data-rich historical records and papers on the region’s history, my reluctance to change slowly crumbled and ebbed away. It’s not completely gone, of course. Change has its limits, at least as far as cultures and traditions are concerned. A perfect example would be cultural misappropriation. Both non-Igorots and Igorots are guilty of this sin. It’s bad because it wants to affect change through ignorance. The kind of change we can accept should be the ones that are done with respect, with class, and in good taste. Lest the reader makes the assumption that I look down on purists, I do not. I’m simply offering these ideas as things to think about. I'm also not saying that I carry the right stance and that those who oppose it are wrong. Like I always do with my old friend from college, I'd be more than willing to agree to disagree.